While I am making my way through The Thin Place (it is going a bit slowly), I thought I would tell you about another book I read recently that I really liked. And that would be Z: A Novel of Zelda Fitzgerald by Therese Anne Fowler. 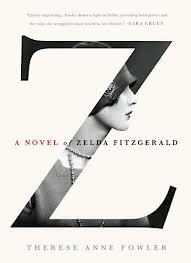 Z is the fictional story of the real Zelda Fitzgerald, wife of The Great Gatsby author F. Scott Fitzgerald. Z is in the same vein as Loving Frank, The American Wife, and The Paris Wife, all of which I read and liked. I actually listened to The Paris Wife and, while I didn’t care for the narration of the audiobook, I really enjoyed Paula McLain’s story about the Hemingways, which made it extra fun to read Z. In The Paris Wife, the Fitzgeralds are very minor characters and are not portrayed well. In Z, the Hemingways are much bigger characters and are also not portrayed well. It’s entertaining to see all the drama that went on between the famous names of that time. Even Hemingway malarkey aside, Z is a great look into the world of the Fitzgeralds. Zelda has been a misunderstood figure in literary history and Fowler has approached her sympathetically. Now I want to know even more about her.